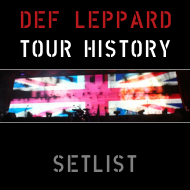 Def Leppard played show 44 of their Summer Tour 2014 last night in Monterrey, MEXICO and here are the setlist statistics. The show took place at Parque Acero Fundidora with 17 full songs played by Lep. View all the stats below after 44 shows. The next live appearance takes place on 28th September in London, England. 17 full songs played and one snippet. 15 of these songs were played at the last Monterrey show in September 2012. 'Action' was last played here at the Auditorio Nacional on 17th November 2005 during the Rock Of Ages tour. 'Too Late For Love' was last played here on 25th September 1993 during the Adrenalize tour. 17 songs played from four studio albums/one compilation album.